A show in Cambridge’s newest venue; a multi-purpose performance centre for the new community of Eddington on the edge of the city. Ian Jeffs is a local singer/songwriter and is now performing with an as yet unnamed backing band. He has an amiable personality which the crowd soon warms to, along with a lived-in voice and thoughtful lyrics. The slower numbers featured his own acoustic guitar with some echoing electric stylings a bit like classic ‘One World’ John Martyn. Second song ‘Higher’ appropriately enough drifted up into the distant elevated ceiling of this unusual cuboid venue, which must flood with light when used in the daytime. ‘Warm Blooded’ was rockier while ‘Talking To MH’ built up from some subtle acoustic picking to a haunting hookline. ‘Last Days At The Farm’ is the signature track, its descriptive words brought to life by his powerful vocals. With no preamble Dave Tattersall started off with oldie country-folkster ‘Sweetheart’ and as the rest of the Wave Pictures joined in we knew that as always the next hour would be a treat. Second song ‘Remains’ was one of the highlights of their rare vinyl-only album ‘A Season In Hull’, the following sugar-themed uptempo jive I hope is on the next LP and when Franic Rozycki does the familiar slide down the neck of his bass it has to be the majestic ‘Pool Hall’. The first quartet of songs sat together perfectly and represented as good a short summation of the band as you could expect to hear. Having only been released for a day the new ‘Brushes With Happiness’ LP is a concoction still to savour properly but it is very much a mellow, late night delicacy. ‘Volcano’ is steady, sparse and emotive and as the rest of the new collection it has a distant lyrical melancholia. These new songs describe a world of random discarded objects, burnt matches and rain through window panes; viewed with a similar detachment to the narrator in much earlier song ‘Beer In The Breakers’. Best of the newbies is ‘Laces’ (‘…i’m glad you never tried to change me..you never even asked me to stay…’). It was no surprise when Jonny Helm stepped out from behind the kit for his customary solo vocal, but I didn’t expect a cover of Van Morrison’s ‘And It Stoned Me’, sung without microphone (there seemed to be some issues with mics and monitors that didn’t get fully resolved) and given the subtlest of guitar and bass accompaniment. ‘The Running Man’ closed the main set then the unrelenting nightmare tale of ‘The Woods’ and finally Dave ditched the microphone for newie ‘The Red Suitcase’ drifting away slowly and ‘..waving to the waves……‘. This entry was posted in Music and tagged Brushes With Happiness, Cambridge, Eddington, Ian Jeffs, live, review, Storey's Field Centre, Wave Pictures on June 25, 2018 by iknoweno. Something special from the Wave Pictures, a vinyl-only album recorded around one microphone in one day with all-new songs. Despite this back to basics technique as far as I can tell the sound quality/mix/balance etc seems to be absolutely fine (so why do most bands spend ‘months’ in the studio?). In the subtle ‘Thin Lizzy Live And Dangerous’ that raucous masterpiece is playing in the loft as a tongue-tied love is declared. One of the best tracks is the playful and addictive ‘David In A Field Of Pumpkins’. While crawling around amongst the orange gourds David sings a daydreaming speculation of ‘if I could fly straight over the town I would knock upon your window…’ ; somehow it all makes perfect sense. They are playing many of these songs live on the current tour and they slot perfectly in with older favourites. 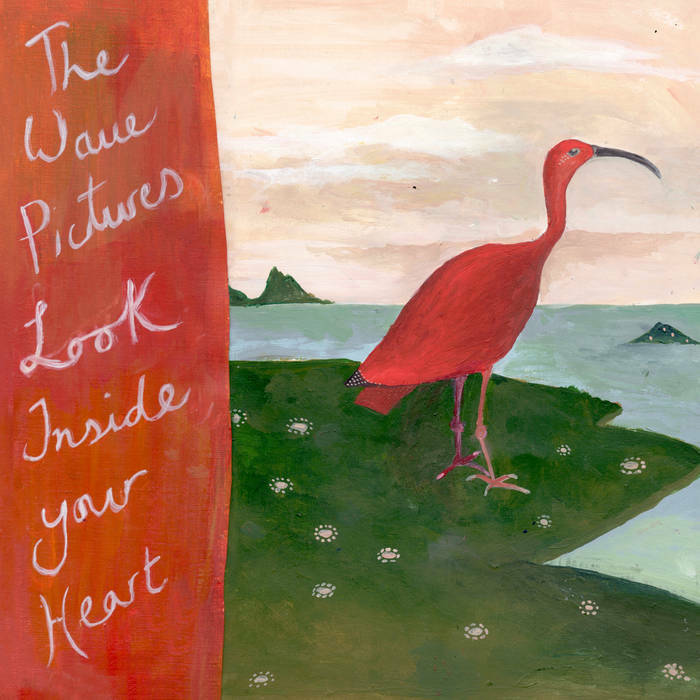 With another new album due later this year the brilliant Wave Pictures go from strength to strength. This entry was posted in Music and tagged A Season In Hull, acoustic, LP, review, vinyl, Wave Pictures on March 8, 2016 by iknoweno. Singer/guitarist B-Sydes (the performing name of Ben Sydes) opened the show playing tracks from his debut long-player ‘Constant Fictions’. On the album (check out the cover artwork?) a full band give more of a variety of aural textures, but with his solo guitar and intense vocals he convincingly expresses some heartfelt emotional lyrics. He has folk influences but the rockier rhythms come through strongly and there was a positive audience reaction. There were a few of these new songs featured, sounding promising on first hearing but we also had a selection across nearly all of their extensive back catalogue. Their sound is uncluttered, no effects pedals for guitar and bass and Dave Tattersall’s lyrics draw you into a personal world of memories, wry observations, wistful longings and regrets. All three members have their turn in the spotlight, sliding bass breaks, pounding drum solos and the dynamic yet relaxed guitar lines which anchors it all. They can rock out; ‘Pea Green Coat’ is polite-ish punk, ‘Give Me A Second Chance’ is pleading desperation over rock-solid drums and bass. ‘Cassius Clay’ and ‘Now You Are Pregnant’ are quieter tracks with an extra emotional punch to the lyrics. And who can resist the tempting delights of ‘Friday Night In Loughborough’?? The band can easily move into cross-cultural rhythmic and dance styles, such as ‘Blink Back A Tear’ and the tour-de-force nostalgia rush of ‘Before This Day’. And much much more. This entry was posted in Music and tagged A Season In Hull, B-Sydes, Cambridge, Constant Fictions, live, Portland Arms, review, Wave Pictures on February 19, 2016 by iknoweno. A track by track review of Great Big Flamingo Burning Moon, the sixth studio album from Indie trio The Wave Pictures. I am a big fan of the 2013 double album ‘City Forgiveness’ and after a few listens and seeing them live this one is different, but right up there too. 1. Great Big Flamingo Burning Moon. What a great opener, driving bass and drums, surreal and evocative lyric, imagine driving through the desert at night. This track features rhythm guitar from cult artist Billy Childish, the main collaborator and co-writer on this album. 2. I Could Hear The Telephone(3 Floors Above Me). This was the first song played when I saw the band recently, now released as a single. This track highlights the trademark guitar of Dave Tattersall along with some Beatle-esque flourishes and words of minor domestic paranoia. It works its way into your head and stays there. 4. At Dusk You Took Down The Blinds. The title says it all, a quiet love song, gradually turning in on itself. Sparse guitar and light drumming, very effective. 5. All The Birds Lined Up Dot Dot Dot. A rolling bass and guitar and interlocking drum patterns from Jonny Helm. Again the lyric has a feel of (gently) impending doom. 6. Frogs Sing Loudly In The Ditches. Followed by ‘…dragonflies hover overhead’, a title inspired by a mild warning sign at a country hotel! A bit of Half Man Half Biscuit sentiment creeping in here lyrically and plenty going on musically. 7. Sinister Purpose. The first of two cover versions of Creedence Clearwater Revival songs, a rocky edge to this one. 8. Green River. More bluesy this time, with lots of harmonica added to the mood. 9. Fake Fox Fur Pillowcase. Another catchy original, one of my favourites featuring personal insecurities described over big chords and hefty bass and drums. 10. The Fire Alarm. A similar pounding feel to this track, with nightmarish images of nature and instead of the phone ringing it is now the fire-alarm that disturbs. 11. The Goldfish. A superb showcase for the bass, a strong chorus and the singer again mildly tortured, this time by a deserted room and a disquieting fish. 12. We Fell Asleep In The Blue Tent. Juju Claudius adds contrasting backing vocals to this intricate tale of growing up. A summery and nostalgic set of images. 13. Pea Green Coat. The first single from the album, harmonica and sharp chords give it a Wilko Johnson vibe and make the garment in the title sound as cool as it could possibly be. This entry was posted in Music and tagged album, Billy Childish, Dave Tattersall, Great Big Flamingo Burning Moon, review, Wave Pictures on February 17, 2015 by iknoweno. Another strong line-up for a sold out evening at The Portland, starting with Ben Garnet, otherwise known as The Organ Grinder’s Monkey, a regular in Cambridge (and on this site) with his guitar/random sounds/voice/laptop combination. A large audience was already in the venue, reacting well to the electronica, triggered effects and manipulated vocals of hours of painstaking studio crafting being let loose to run free in the live performance. Older songs ‘Testing the Theory…’ and ‘See This Through’ sound as good as ever as does the heavy bass and denser instrumentation of new track ‘False Economy’. Apparently new experiments in stereo are pushing the capacity of the laptop (Bill) beyond its limits but it looks like this creative partnership will run and run. The Wave Pictures are a likeable and unassuming trio, their sparse tight sound and onstage interplay creates a captivating and engrossing show. Having formed in 1998, they have recorded many albums as themselves or collaborations with a variety of performers, also they have covered songs by cult outsider American singer Daniel Johnston. Complex lyrics featuring relationships, domestic trivia, assorted wildlife and name checks of Johnny Cash, Tracey Emin and The Real Slim Shady(!) are delivered mainly by guitarist Dave Tattersall with drummer Jonny Helm leading on some songs. Along with bassist Franic Rozycki the band are accomplished musicians, their trademark indie rock is clear sounding and intricate guitar solos interspersed with busy basslines and solid drums. There are also departures in musical styles, the polyrhythmic shuffle of ‘Before This Day’ was an early highlight. At times I was reminded of the minimal relaxed sound and lyrical concerns of Jonathan Richman, another live performer with the ability to have the audience losing themselves in his unique musical world. Soon to be released album Great Big Flamingo Burning Moon featured strongly, then the show ended with requests, all warmly received by the very attentive audience. This entry was posted in Music and tagged Cambridge, Great Big Flamingo Burning Moon, live, Organ Grinder's Monkey, Portland Arms, review, Violet Woods, Wave Pictures on February 5, 2015 by iknoweno.